Let me explain. First, my statement that iOS is “becoming awful.” Faithful readers know I’m not a fan of iOS. I switched to Android almost two years ago, and I’ve never looked back. But it’s not as if the Android interface is much better – I just like its chances of developing into something more powerful down the line. In the past few years, I’ve written several posts about the kind of interface I believe needs to emerge across mobile (which until last year, Apple pretty much dominated). Given my obsession with the topic, it’s probably no secret that I view mobile’s biggest problem boils down to one of search. In Apple Won’t Build a (Web) Search Engine and Of Course Apple Is Going to Do Search, I argued that Apple must get into the “app search” game. Just as web search became the coin of the web realm, app search will be next. It won’t look like web search, I argued, but at its core, it’s quite similar. That was three years ago, right after Apple bought Siri, launched iAds, and was relentlessly touting the growth of its app ecosystem. I was certain Apple was going to figure out a way to create value above the level of a particular app, using all that tasty data it had within its restrictive walled garden to build the next generation iOS interface. Google knows it, which is why I find Google Now so fascinating. Apple knows it too – the days of home screens littered with app icons are numbered. What will replace it? My guess is some kind of intelligent, search-driven interface that “understands” you, based on the intent you signal through your use of all kinds of apps – including browser apps, of course, as well as true search apps like Siri (or Google Now). This new kind of interface responds to your voice as well as your location, your history, and anything else you might willingly (or unwittingly) feed it. It will strive to always put the very thing you need at your fingertips – something that simply isn’t possible without understanding your interactions as the equivalent of …. well, a personal interest graph. And to do that, Apple needs a powerful engine, the kind of engine that, say, has been hard at work understanding a massive corpus of interest data for, say, six or so years. Something like Topsy. My prediction: Apple doesn’t really care about Twitter data. The more I think about it, the more I’d wager that Twitter most likely blessed Apple’s purchase – and why not. With its newfound post-IPO billions, Twitter could have easily forced Topsy’s price well past $200 million. But Twitter is probably thrilled that Apple bought Topsy – Apple just took out a company that Twitter eventually would have had to either buy or kill. Now, Twitter is free to build enterprise value on top of its own data, as well it should, and Apple has a team of engineers who I’m guessing can’t wait to get their hands on a new kind of tweet stream – all that structured data captured, but not leveraged, off your mobile phone. It’s a win win win – if I’m right. Apple gets the tech and talent to build the guts of its next interface, consumers get a better OS, and Twitter gets to keep its cash and eliminate a potential competitor to boot. Smart move, Apple. I hope I’m right. *For the record, I spoke to no one at Twitter or Apple before I wrote this. It’s all my own brand of pure speculation. That’s a very interesting offspring considering Topsy’s direct social value. I guess skimming new social data to personalize better ad ranking may be too presumptuous; I look forward to an enhanced interface! Yes, Topsy has value as a social search engine, but honestly, most of us need to search more than our social connections. We need search to drive our interface, not just social. Very interesting thoughts John, something I wouldn’t have considered. I completely get your point about the various apps on ones phone which are compeletely disconnected but do you think a search layer powered by Topsy as you say, is really the answer? Given that we now live in a world where every phone is almost always connected to the web, isn’t the real solution some sort of Google Now type platform which IS your phone? No need for any apps or even a browser, the web just is. Perhaps I’ve misread/seen your vision of what a iOS with Topsy but to me I think the real innovation will be what I tried to describe – something that can serve you whatever info you want whenever you want it without having to install or download anything. Not sure the two are incompatible, I do agree Now is an important product, see my post on it (linked in this post). The more I think about Google Now, the more doubts I have about whether Google is going to be the company that wins at whatever proactive/advisory/dynamic application content delivery paradigm emerges. If you play it forward, the only thing that seems to work would be for Google to open up its knowledge graph to third party application/content providers in order to justify the tax they’d have to levy on third parties to participate. Otherwise Google would have to so utterly dominant such that third parties had no choice. Because of the massive impact on its lifeblood (advertising revenue), Google can’t move fast on this and it seems that while Google ponders all this stuff over the next several years, there is plenty of time for a more open, user-controlled/centric model to emerge. What is it about Topsy that can provide a similar service to Google Now? Does Topsy have an “intelligent” search engine and what does that actually mean? Does the current Topsy service offer intelligent personalization? It culls the “interest graph”. Although the reality is that Google Now (or whatever the idealized future of that type of interface is) relies on highly structured data, not the infinite pile of whispers that Topsy, DataSift, et al are trying to wrangle. Arguably Facebook should be a leading indicator of what could be done with this type of content and unless the future is simply more ads that are weirdly off-target, I really wonder if this stuff is going to end up being meaningful to consumers or just corporate marketing groups. like trying out new apps but not as much as before and it is mainly the boys. market to the fuddy duddies only? teenagers and young adults. Just sayin! I think we broadly agree on all this. I guess I was a bit British in describing all the things Apple could do with Topsy. I guess my point is that the search problem – which is an interface problem – is what Topsy will solve for Apple. On the mobile device, the class of things we search for that are raw page-ranky, web crawler search that old Google excelled at are markedly less important. We want to find shops, restaurants, appointments, phone numbers, funny things being said about the TV show we are watching now, conversations about the weather. Everything that is related to ‘now’ (i.e streams of content) and people (i.e. 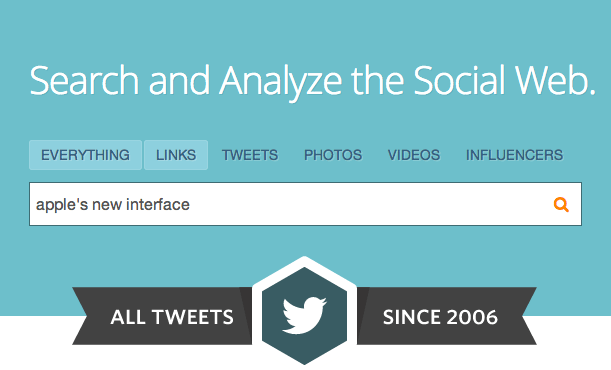 social graph) Topsy can help Apple with. If we use our iOS device to find out weird stuff from deeply recessed parts of the Web, we can always drop down to Google’s amazing search offering. So yes, Topsy could enable a smart iOs interface, which I content will be fundamentally about discovering stuff local (or in the now) to us. From our (PeerIndex) perspective, we’re delighted with Apple’s move. It shows just how much value there is in surfacing the chatter between your customers now. So this is obviously a great part of our story too. I felt Topsy had great technology but beyond that sort of solved the wrong problem. (Topsy wiped the floor in social media monitoring, because the competition was so poor and unvisionary; but I don’t think Topsy beyond phenomenal engineering articulated a path-breaking Vision. Apple might bring that – the boldness of Siri is a good example of that). Indeed Azeem, well put. Thanks for coming over!